An exhibition organised by the Emirates Red Crescent (ERC), in coordination with the Federal National Council (FNC) opened yesterday in Brussels to promote UAE’s humanitarian and developmental efforts and aid to various world countries, which stands at US$32.01 billion from 2013 through 2017, from which millions of refugees and displaced people around the world benefitted, including10 million Yemenis. Titled, "From Humanitarian Aid to Stability," the three-day exhibition aims to disseminate more knowledge about UAE’s values and principles premised on providing aid without discrimination on the basis of religion, colour or race. Attending the exhibition's opening were European Parliament President Antonio Tajani and Dr. Amal Abdullah Al Qubaisi, Speaker of Federal National Council, FNC, along with the ERC delegation now on an official visit to the European Parliament in Brussels from 7th to 11th January, 2019. 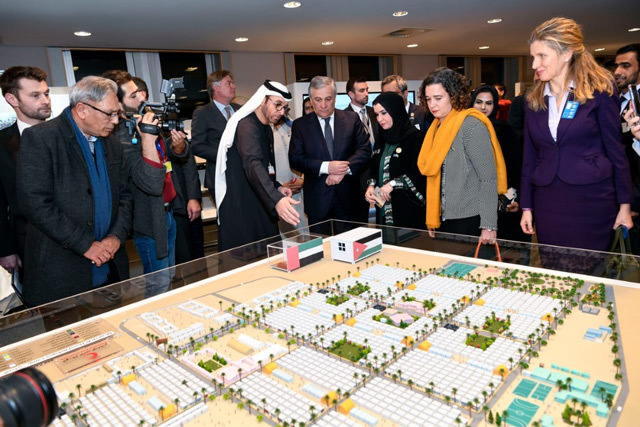 Addressing the exhibition's inaugural ceremony, Tajani expressed sincere appreciation of the humanitarian and relief efforts tirelessly made by the UAE, underlining the need for forging a joint action by Europe and UAE to address the issue of illegitimate refugees. He also underscored the necessity for doubling efforts to counter terrorism and ensure security and stability all over the world. "Under the leadership of President His Highness Sheikh Khalifa bin Zayed Al Nahyan, His Highness Sheikh Mohammed bin Rashid Al Maktoum, Vice President, Prime Minister and Ruler of Dubai, His Highness Sheikh Mohamed bin Zayed Al Nahyan, Crown Prince of Abu Dhabi and Deputy Supreme Commander of the UAE Armed Forces, and their Highnesses the Rulers of the Emirates, the UAE is pursuing the path laid by late Sheikh Zayed to effectively contribute to easing the suffering of the needy and poor all over the globe," said Al Qubaisi. For his part, Fahad Abdul Rahman bin Sultan, ERC's Deputy Secretary-General for International Aid, said the UAE developmental and humanitarian aid is focued on meeting the needs of refugees and displaced in stricken areas around the world, including Syria, Yemen, Somalia, Palestine, Iraq and Afghanistan, among other regions that are suffering armed conflicts and severe humanitarian crises. "UAE's humanitarian aid included US$4.92 billion to Yemen since April 2015 through December 2018; $174.6 million to Libya from 2013 through 2017; $963.5 million to Syrian people from 2012 to November 2018; $641.5 million to Iraq from 2013 to 2017; $233.3 million to Somalia from 2013 to 2017; and $489 million to Palestinians from 2013 to 2018," said bin Sultan. "The UAE reaches out to more than 100 countries around the world and our aid covers all continents," he said, noting that there are 14 ERC offices operating in various world nations to launch and follow up the country's developmental and aid projects. "There are two offices in Palestine, and the rest in Erbil, Lebanon, Somalia, Egypt, Tunisia, Kazakhstan, Indonesia, Pakistan, Afghanistan, Bosnia, Albania and Yemen," he said. "In Kurdistan, we established three residential communities for Syrian refugees and displaced Iraqis who had fled the areas controlled by Daesh. They are all well equipped with electricity, water, schools, hospitals, markets, and kids areas. They bring together followers of various religions who are all living together in peaceful co-existence in yet a new testament to the UAE determination to promote its culture of tolerance and acceptance of others," he added. "Relief aid is being consistently provided to displaced people outside these sprawling humanitarian camps, while hospitals have been established in Arbil, including Mother of the Nation Eye Hospital in Erbil; Eyal Zayed (Zayed's Sons) Hospital and Ataya Hospital. "In implementation of the directives of the H.H. Sheikh Hamdan bin Zayed Al Nahyan, Ruler's Representative in Al Dhafra Region, Chairman of the Emirates Red Crescent, the ERC is continuing to provide aid and relief material to Syrians, both inside Syria through various international humanitarian organisations, and outside the country in refugee camps. This is in addition to the considerable developmental and relief aid being provided in Yemen since 1980s." "UAE aid to Yemen includes establishment of hospitals, providing power and electricity as well solar power, drilling wells, launching community development projects for the benefit of the martyrs' households in addition to supporting fishermen with boats and maintaining ports to augment fish production together with intensifying anti-mining campaigns." 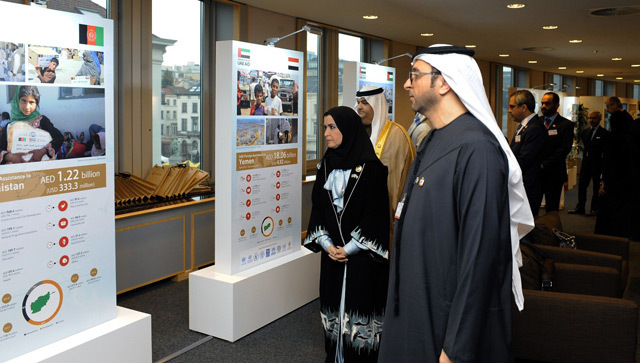 The exhibition includes photos, videos and statistics related to Emirati humanitarian and development aid, and will showcase the relief aid, medical and food supplies, tents and educational support provided by the UAE, as well as relevant statistics, such as the number of beneficiaries from six continents and their countries. It also showcases documentary photos of the ERC’s humanitarian and development efforts around the world, as well as the educational, health, social, emergency, water and electricity services it provides to many regions and countries, including Yemen, Somalia, Syria, Palestine and Afghanistan. Also attending the showcase were Antonio Lopez-Isturiz White, President of the UAE-EU Parliamentary Friendship Group, along with a number of the European Parliament members, European officials, and ambassadors of various countries accredited to Belgium.